What a great start to the season for the New York Yankees in 2018. The Yankees season got off to a bang. 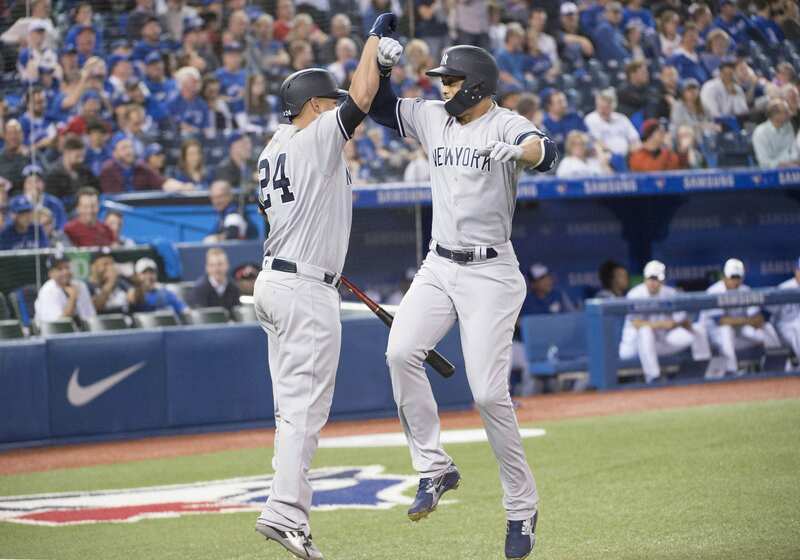 The Yankees beat the Toronto Blue Jays 6-1. Brett Gardner reached base on an E7 from former Yankee Curtis Granderson, and Giancarlo Stanton blasted an opposite field homer in his first at bat of the season. The Yankees added two runs to their lead in the fifth when Stanton and Gary Sanchez hit back to back two out doubles. Brett Gardner then hit a solo homer in the sixth off of Blue Jay reliever Danny Barnes. The Yankees final run came on another Stanton homer in the eighth and this time he hit a solo one off of old Yankee Tyler Clippard. All in all the Yankees offense was fantastic today and the newest Bronx Bomber Giancarlo Stanton played a big role in the win. Aaron Judge also had a productive day hitting ahead of Stanton as he went 2-4 with a double and single. This was only a taste of what the Yankees offense will look like this season. Luis Severino proved today that he is the Yankees ace. After facing some trouble in the first Severino struck out Kendrys Morales to strand two runners on base. Severino settled down and compiled a strong 5.2 innings pitched and only surrended one hit, a single to Granderson in the fourth. Chad Green came into the game in relief of Severino in the sixth and struck out Granderson for his first strikeout of the year. Green came back out to pitch the seventh and retired the Blue Jays in order. Betances came onto pitch the eighth and served up a solo homer to Kevin Pillar on the first pitch he threw. Betances settled down and retired the next three hitters. Chapman came on to pitch the ninth and retired the Blue Jays in order to seal the win for the Yankees and earn Aaron Boone’s first win as a manager. Without question Giancarlo Stanton is the Yankees player of the game for the Yankees. He had a tremendous debut and was the first Yankee to homer in his first at-bat as a Yankee since Aaron Judge in 2016.